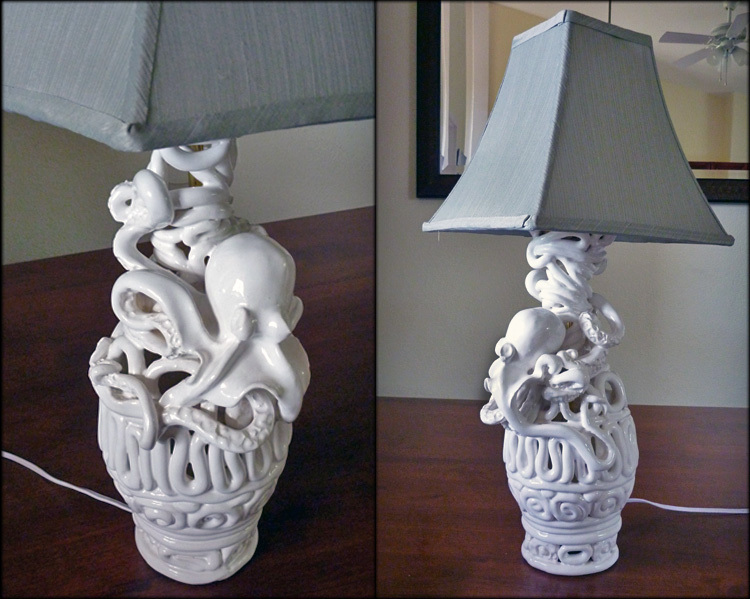 I constructed this lamp as an example for my Kapaa Middle School students, who are building coiled vessels that incorporate an animal or sea creature. 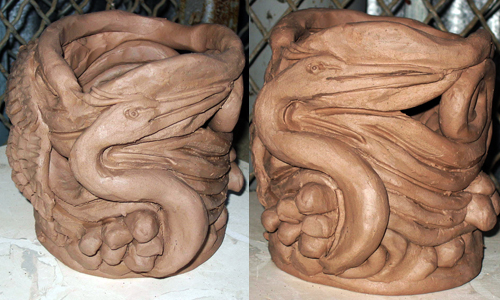 I used an octopus (locally referred to as “Tako”) as my example to demonstrate how the tentacles could be interwoven and entwined within the coil design. 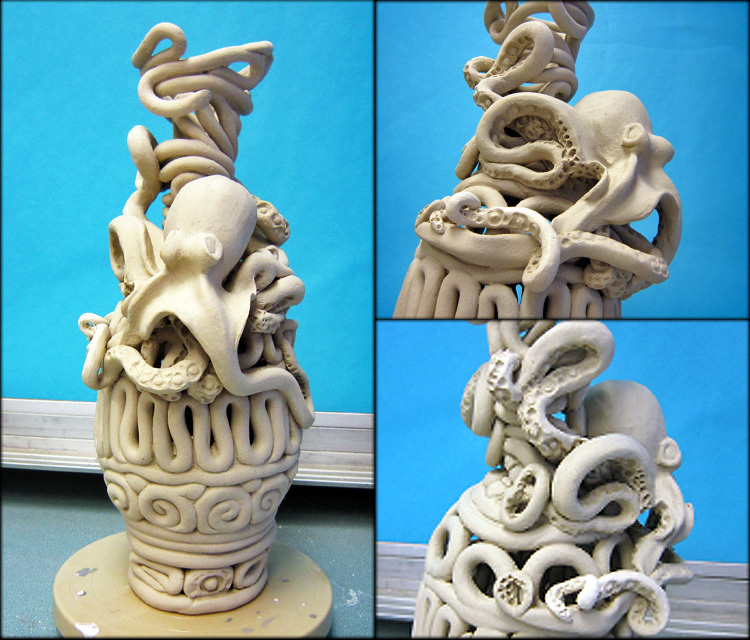 I wanted my octopus to blend in with my coil pot in the same way that real Octopus are able to camouflage themselves against the reef. Kapaa Middle School Art students recently finished a coil-building project in which they incorporated an animal, sea-creature, or insect into their design. I’m so impressed with the creativity and talent demonstrated by these 7th and 8th grade students… the final products exceeded my expectations! 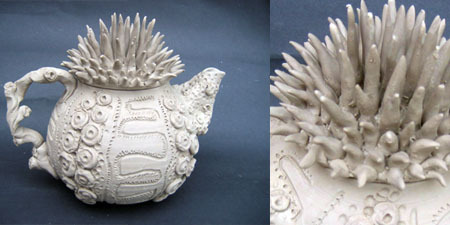 I’m finally getting around to glazing some of my teapots. I like this one even better now that it’s colored… Anyone want to come to a tea party? Here are the completed mask examples that I created. 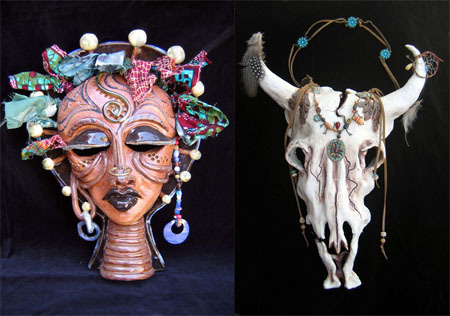 The fabric additions on the left mask were recycled headdress materials from my friend Lara. Mom, you may recognize a few items that are attached to the skull… I hope it’s not too creepy. The new Geil kiln arrived at school over the spring break! We’re loading it up with projects and placing our kiln gods to watch over next week’s first firing. Here’s a peek at the current project in class. My students continually astound me with their skill and creativity! 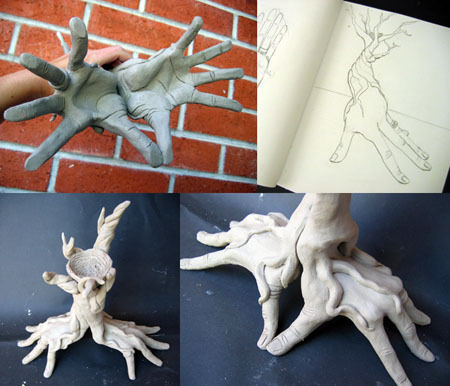 Currently my classes are learning about the work of Rodin, and studying their own hands through clay. They are either sculpting two hands interacting with one another, or one hand interacting with an object. Of course I had to join in the fun. 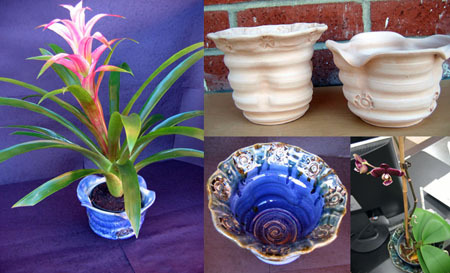 Gloria (La Serna secretary) was recently looking for a pot to fit her beautiful orchids. I made two, just in case one fit better. She now has one on her desk, and the other I donated to a school fundraiser where it was auctioned off. These are the finished totem poles that will eventually be planted in our sculpture garden. 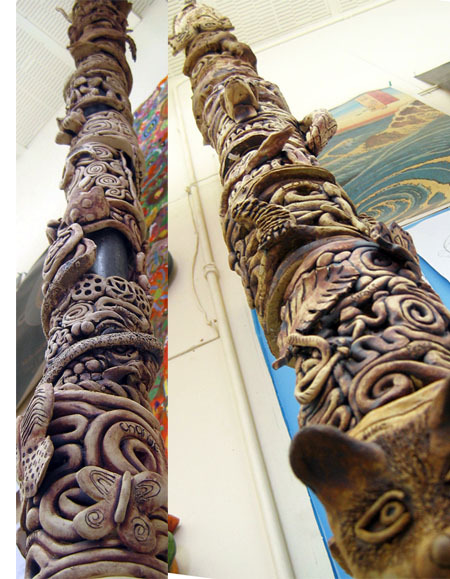 This is one section of a larger “totem pole” made from coils of clay and sculpted symbolic animals. 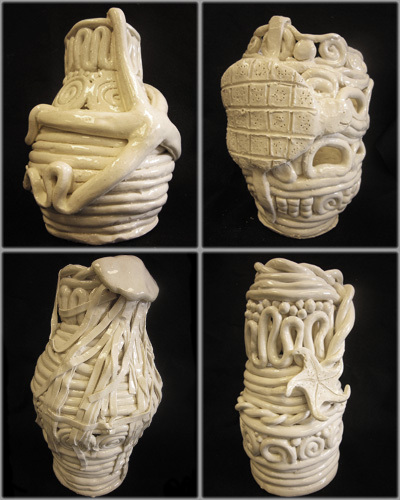 I’m still working on this one as an example for my Ceramics students, who will be collaborating in groups to complete two finished 10′ poles. This porcelain teapot isn’t fired yet, but I’m leaning towards a transparent shiny glaze on the inside, and raw unglazed porcelain outside. When finished, it will be an even brighter white than pictured here. 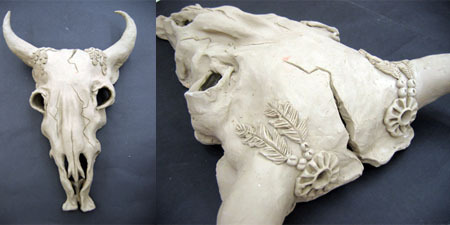 As I was working on this porcelain scull, I was thinking about some of Georgia O’Keefe’s southwest paintings. I’m still unsure of whether I will glaze all or part of this piece, and I’m playing with the idea of incorporating beaded patterns and feathers. 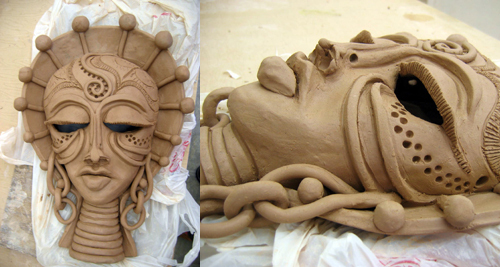 This is a sample I made to demonstrate the process of mask-making for my students. 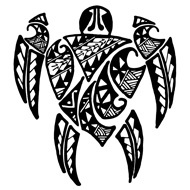 Inspiration was derived from African art, and body art from a variety of cultures. While working on this face, I was thinking about the ritual scarring practiced by many African tribes, Maori facial tattoos, and the Indian art of Mehndi. The neck coils are reminiscent of the Kayan women of Myanmar and Thailand who modify their bodies by stretching out their necks with ornamental brass coils.